The first five items appeared on separate pages in the original version of the Around Naples Encyclopedia on the dates indicated. They have been consolidated here onto a single page. Additionally, item six is an update from Sept. 2014. Piazza del Gesù Nuovo may be considered the bridge between the ancient Greco-Roman city of Neapolis and the city of the Spanish vicerealm that expanded to the west in the 1500s under the direction of the Viceroy Don Pedro di Toledo. Under the earlier Angevin rule, there had been a western gate to the city at Piazza del Gesù that the Spanish simply moved over to Largo Mercatello (modern-day Piazza Dante), when they built the grand avenue now known as via Toledo (or via Roma). The square, Piazza del Gesù Nuovo, contains some remarkable structures. 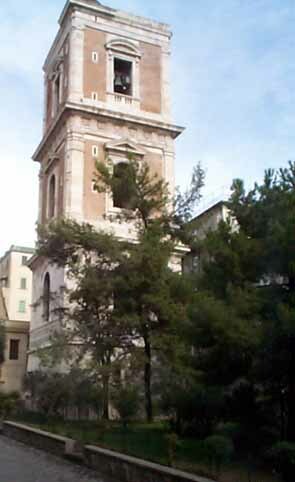 First, there is the thirteenth-century Gothic church/convent of Santa Chiara, marked most obviously by the belfry (photo, left) that stands within the grounds at the end of the square. The convent was built between 1310 and 1328 by architect Gagliardo Primario at the behest of the wife of King Robert of Anjou. It still retains the citadel-like walls setting it apart from the outside world, walls that contained a vast religious community—and today contain a more modest one—made up of the Convent of the Poor Clares and, beside it, a monastery of Grey Friars, both dominated by the stark architecture of the church itself. The complex was expanded along Baroque lines in the 1700s. It was almost entirely destroyed by bombing in WW II and was restored to its original Gothic form, retaining only a few reminders of the Baroque. King’s Robert’s tomb is within the church, and bears the epitaph by Petrarch: Cernite Robertum regem virtute refertum, reminding the people to “consider Robert a King rich in virtue”. The most striking building in the square other than the church of Santa Chiara is the 15th-century residence built for Robert Sanseverino, Prince of Salerno. It is now the Church of Gesù Nuovo (photo, left) and has given its name to the entire square. (It is one of those churches in Naples that started out as something else. The word "new" in the name of the church is to distinguish it from the church of Gesù Vecchio (old) about a half-mile away.) The unusual façade is called "ashlar" in architectural terminology and is one of the few examples of this characteristic 15th-century façade in Naples.The building was finished in 1470 and was a symbol of the baron's increasing power and favor within the court of Ferrante of Aragon, ruler of the Kingdom of Naples at the time. The architect was Novello da San Lucano. [See this entry for more on him and his connection with some peculiar musical notation inscribed on the facade of the building!] The baron died shortly thereafter and the building passed to his son, Antonello. Young Tony, however, quickly became enmeshed in conspiracy against the throne and was forced to flee the city of Naples and hole up in a fortress near Salerno. He was captured and exiled to Senigallia (no, not Senegal—it's a town on the Adriatic). His property was confiscated. He eventually got the property back from the Spanish throne when they took over the kingdom. The large residence then passed to his son, Ferrante. In 1547, Ferrante incurred the wrath of the Spanish viceroy, Don Pedro Alvarez de Toledo, and fled the kingdom, dying in Avignon, France, in 1568. His property was put up for sale and the residence was bought by Niccolò Grimaldi in 1584 who, in turn, sold it to the Jesuit order. It was transformed into a church, leaving the original façade intact, and was consecrated in 1601. The church passed to a Franciscan order when the Jesuits were expelled from Naples in 1767. The Jesuits got the church back in 1821. The highly ornamental interior of the church belies its solemn exterior. The spectacular frescoes on the ceiling of the central nave are by Belisario Corenzio and Paolo de Matteis. Also, the church has on display The Expulsion of Heliodorus from the Temple (1725) one of the most noteworthy works by Francesco Solimena, the great painter of the Neapolitan Baroque. The building, because of its checkered history, first as a residence, then as a church—what with people getting exiled, dying, etc. etc.—used to have somewhat the reputation of being under an evil spell. Some students of the supernatural have enjoyed attributing this malevolent presence to the esoteric properties of the stones in the unusual façade. Literally "topping off’ the square is the Spire of the Immaculate Virgin, erected in 1750 with funds collected through public subscription sponsored by Jesuit Father Francesco Pepe. The spire replaced an earlier equestrian statue erected in 1705 on the occasion of a visit to Naples by Philip V of Spain. When the Spanish left the city and were replaced by the Austrians, that statue was destroyed by the populace. Some of the finest sculptors of the 1700s worked on the spire one sees today: among others, Francesco Pagani and Matteo Bottiglieri. Depicted on the spire, among other scenes, are the Presentation of Jesus at the Temple; The Birth of the Virgin Mary; and The Annunciation. The spire, itself, represents the presence of the Jesuit Order in the city. Its rich ornamentation is considered the epitome of Neapolitan Baroque sculpture. 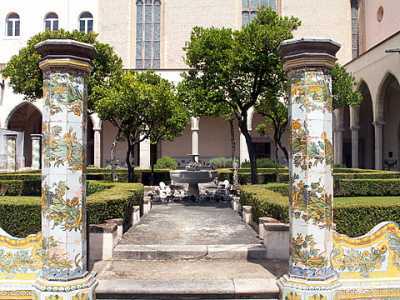 The column is one of the three so-called "plague columns" of Naples, also called votive spires. They were all put up after the plague of 1656 as votive offerings. The other two are the one at Piazza San Domenico Maggiore and the Guglia di San Gennaro. A ceremony was held in the city hall the other day in memory of (1) the destruction of the church of Santa Chiara in 1943 and (2) the rebuilding of that church, completed over ten years later. (See items, below.) That rebuilding is responsible for the odd feeling you get when you stand in the courtyard and stare at the plain masonry and stark Gothic architecture of the church: Santa Chiara seems at once as old as it is and, yet, much newer. It is both. On August 4, 1943, after 95 previous air raids on the city of Naples aimed primarily at military installations near the port and train station, the next attack accidentally hit the church and, as they say here, “destroyed six centuries in ten seconds.” (Robert of Anjou built the original church in 1310.) The fire burned for 10 days; 159 persons were killed and 228 were wounded. The church was left a burned-out shell. The belfry on the grounds (photo, left) is the only part that escaped destruction. A plaque (photo, below) on the front of the church, itself, commemorates the reconstruction, finished in 1953. The mayor of Naples attended the ceremony in the presence of young Franciscan monks, born many years after the event. The ceremony was a tribute to the reconstruction and, as well, to Brother Gaudenzio Dell’Aia, the monk who planned and supervised the work. The church was restored to its original Gothic state, undoing the architectural additions of those who came after the Angevins in the history of Naples. Luigi Ortaglio, the Franciscan who succeeded Dell’Aia as the head of the order in Naples, spoke at the ceremony and called the reconstruction a symbol of the “victory of peace over war” and compared it to resurrection, the rebirth that follows death. STAINED GLASS windows - The manufacture and coloring of glass is ancient. Both the Egyptians and the Romans excelled at making small colored glass objects. There is evidence of the use of colored glass for windows in Christian monasteries or churches from about the 7th century AD. The restored church of Santa Chiara (the building on the right in the top picture on this page) was restored to its original early 14th-century Gothic form. 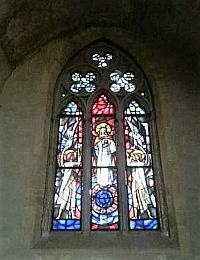 The restoration included the use of a stained glass window (pictured). Generally speaking, stained glass in the windows of Christian churches is more than just colored glass for the sake of ornamentation; it is meant to depict a story or episode from the Bible and to be 'read'. There is no unanimity of opinion among scholars as to whether the restoration of Santa Chiara with such a window is historically accurate--although it is plausible. A few other Gothic churches in Naples use stained glass to tell "stories" at least in the restored versions of the churches (San Pietro a Maiella, for example; also San Lorenzo Maggiore and, elsewhere, at the abbey at Montevergine. Much simpler (possibly tinted) glass in most churches is termed "cathedral glass". The destruction of this, the second most important church in Naples (after the Duomo) was a terrible loss to the city, and the 1953 rebuilding marked the real beginning of the rebirth of Naples after WWII. The courtyard of the ancient monastic grounds was also greatly damaged. 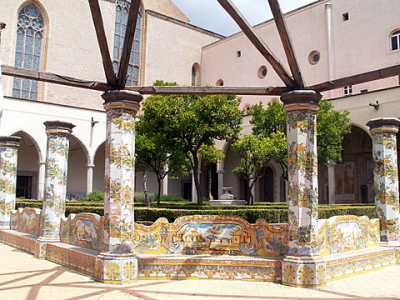 It had been famous, most notably, for the presence of the colorful majolica tilework on the benches and columns. 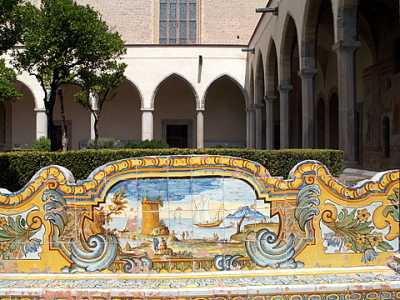 Such tiles were characteristic of the school of Neapolitan ceramic in the mid-1700s. Upon commission of Charles III of Bourbon, the entire courtyard was redone by D.A. Vaccaro in the 1730s; the lovely tilework was the work of Donato Massa, a noted craftsman of the period. Complete restoration of the courtyard is still not complete, and—if one considers the vast amount of work entailed (including the restoration of the frescoes on the walls and ceilings of the arched passageways around the perimeter of the courtyard and the relandscaping of the gardens)—maybe it never will be, but the work done since the year 2000 has had significant results. Dozens of art restorers, masons, and gardeners have been at work. Some of the results can be seen in these photos. The grand church and monastic complex of Santa Chiara continue to amaze. Besides the restored 18th-century majolica tile-work in the courtyard (see item, above), there is now a new museum (photo, right) with a beautifully presented display on the complex from its Angevin origins in the 1300s up to and including current restoration. There are separate sections devoted to history, archaeology, and the devastations of WWII and subsequent restoration of what was once the iconic church and monastery/convent of the Angevin rulers of Naples. 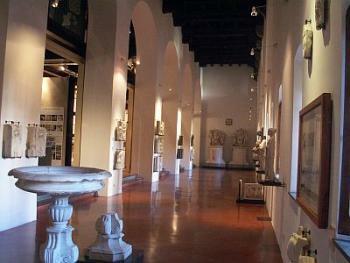 This is another pleasant example of what seems to be a continuing upgrade in the entire museum structure of the city: the new naval section at San Martino, the new Farnese rooms at the National Archaeological Museum, the special archaeology display of the Museo metro station, the museum at San Lorenzo plus a few others. The Santa Chiara museum has the obligatory art & book shop, and on the premises there is also a fine presepe (Christmas manger scene) display. 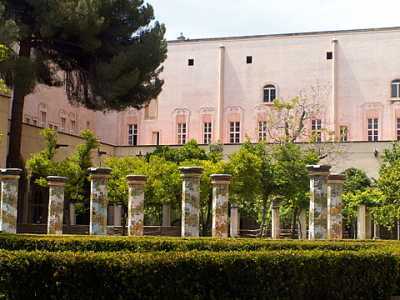 A curious sidelight is that the vineyard, once supported by an extensive trellis over many of the now restored majolica columns in the courtyard, is gone. The moisture on the vines (1) interfered with restoration, and (2) was detrimental to the majolica tiles. Another sidelight is that the newly restored tiles are already decaying in parts. This may have to do with moisture or with idiots like me sitting on the benches. It may also have to do with cagey tile restorers setting themselves up for some more pay-days in the future. Or maybe they just don't make'em like they used to. 5. For an item on the musical notation (!) inscribed on the face of the original Palazzo Sanseverino (now the church of Gesù Nuovo), see this entry. 6. update Sept. 2014 - The city has announced plans to rebuild the gardens and restore the belfry in front of the church. See this link.